My first two weeks in San Francisco yielded my first two parking tickets since this trip, which isn't a bad average. I started to panic last week when I saw what I thought was a third ticket underneath my windshield wiper. However, it was not a ticket. 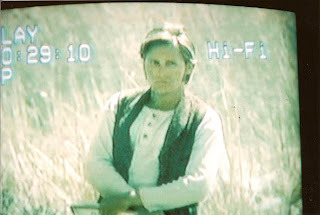 It was a photograph of a television screen that was playing a VHS copy of Young Guns, with Emilio Estevez in the center of the frame. This, my friends, is the WTF?! of the month. I don't know if I should be relieved that I didn't get ticketed or creeped out that someone is leaving pictures of Emilio Estevez on my car.